Anyone can learn how to perform basic cardiopulmonary resuscitation in minutes, with eight CPR kiosks unveiled yesterday - the first for Asia. The Singapore Heart Foundation (SHF), in collaboration with the Singapore Resuscitation and First Aid Council, launched the self-learning kiosks to raise awareness of the life-saving skill. Cardiovascular disease is a leading cause of death in Singapore, wheremore than 2,000 out-of-hospital cardiac arrests occur every year on average. The victim's chance of surviving decreases by around 7 per cent for every minute that passes. The bystander response rate to such cardiac arrest cases now stands at 54 per cent in Singapore, the foundation said. It hopes to increase the response rate with the CPR kiosks, which were launched to commemorate the National Heart Week/World Heart Day 2018. 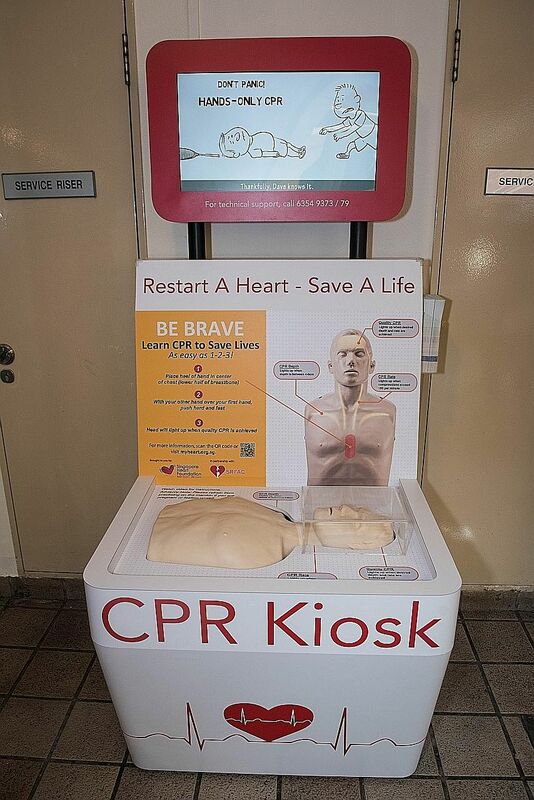 Each kiosk lets users try CPR by using their hands to perform chest compressions on a mannequin's torso. There are short written instructions, as well as a video. The mannequin's head lights up with the right depth and rate of chest compressions. In hands-only CPR, the mouth-to-mouth resuscitation in conventional CPR is eliminated. "There's evidence that using hands alone is life-saving. (Some) people are not comfortable with mouth-to-mouth," said SHF chairman Terrance Chua. The eight CPR kiosks are in busy areas like educational institutions and Toa Payoh HDB Hub, where the launch was held. There are plans to place more at 13 other locations, Professor Chua said. Mr Dhiyab Alsharki, 31, director of a company that sells yogurt, was among those who tried learning CPR at a kiosk yesterday. "Within two minutes, I can have an understanding of CPR. Everyone should have this knowledge," he said. Senior Parliamentary Secretary for Health and Home Affairs Amrin Amin, who was guest of honour, noted that last year, 17 people died every day from heart diseases and stroke, accounting for 30 per cent of all deaths in the year. Mr Amrin said: "The risk factors leading to heart disease and stroke are well studied and many of them - such as obesity, sedentary lifestyles and poor eating habits - are preventable if we can make healthier choices in our daily lives." In a survey whose key findings were unveiled at the launch, the SHF found that some Singaporeans are reluctant to take steps to cut their risk of heart disease. While eight out of 10 surveyed have a good knowledge of heart disease, more than half were unwilling to change their lifestyles or believed that they were not at risk of heart disease. The foundation, with Diabetes Singapore and pharmaceutical firm Boehringer Ingelheim, also unveiled the For Your Sweetheart Singapore campaign to raise awareness of the link between diabetes and heart disease. The campaign ambassadors are celebrity Michelle Chong and her father Steven Chong, who has had both conditions for over 30 years. Ms Chong said: "It was just after my A levels when my father had his triple bypass surgery. My sister and I were pretty shaken up... It is my hope that this campaign will help people with diabetes and their loved ones get the right support."